The BeachTek DXA-SLR PRO HDSLR Audio Adapter is designed to enhance audio quality with virtually any HDSLR camera by providing high quality XLR inputs, AGC disabling, built-in limiting, headphone monitoring, comprehensive metering and more. 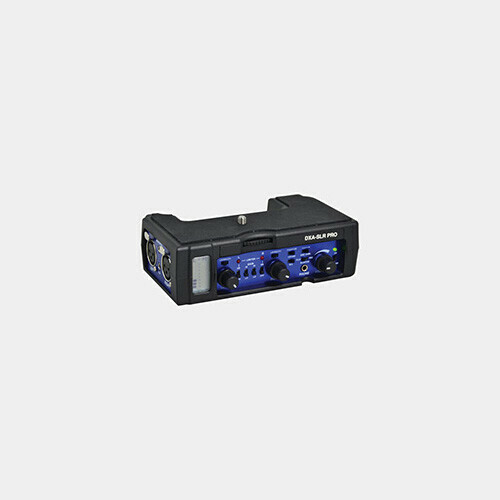 Connect up to two microphones and provide 12 or 48V phantom power to professional condenser microphones. Each channel features a gain control switch with 0 and 15dB settings, and the low-noise preamplifiers and throughput ensure pristine audio quality, wide frequency response and detail. The AGC (Automatic Gain Control) disabling feature eliminates audio level fluctuations that can ruin an otherwise good take. The unit is built tough, mounts to the base of HDSLR cameras, and its rear mounted VU meter displays level in 3 dB increments. Note: Certain cameras, including Panasonic Lumix and Nikon cameras, require particular cables for proper functioning.